Kern’s flagship high performance laser system. 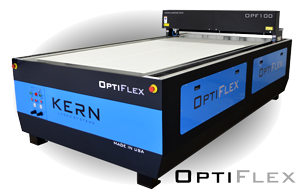 The OptiFlex is Kern’s flagship high performance laser system. The HyperDual motion package installed on the OptiFlex is setting the standard for large format laser cutting and engraving machines. This improved motion system features a rack and pinion design and powerful servo motors at each side of the laser table. Cut acceleration rates are up to three times faster with a 100% increase in top end vector speed. The X axis has also been upgraded with twin linear rails and a thicker steel reinforced belt. The Pipe Rotary, K-Vision Camera and Metal Cutting options are compatible with the entire OptiFlex lineup. Available in 50, 100, 150, 200, 250 and 400 watt configurations. Bed Sizes from 50”x 52” (1270x1320mm) to 120”x 80” (3048x2032mm). HyperDual Motion: The HyperDual motion package features a rack and pinion design driven by powerful servo motors at each side of the table. The results are smooth cut radiuses, quick acceleration rates and the fastest cutting speeds to date. UL / CE / CDRH: A UL certified electrical panel is placed on each laser system which turns on and shuts down components of the laser system. 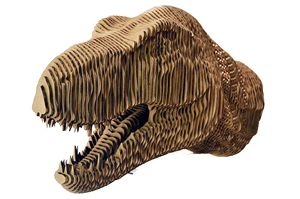 Optiflex laser systems are CE compliant to meet European Union consumer safety, health and environmental requirements. U.S. CDRH compliance requirements are upheld on the Optiflex laser system to meet specifications in 21 CFR, Subchapter J, parts 1040.10 & 1040.11. Sheet Metal Guards: Sheet metal panels are installed around the Optiflex which completely encase the bottom structure of the laser system. All four sides of the table’s work area are accessible for easy loading and unloading of parts.